Kids who love animals or superhero cartoons will love this first installment of the Ratman and Robin book series.Squeaker is a pet rat and he HATES cats - and for good reason. You see, cats have killed his parents and left him for dead. But the good news is, he was taken in by a new family, 8 year old Billy and his parents, and he loves them dearly.But now, Squeaker has a Big Problem - cats are in town - and they are up to no good.Squeaker must stop the cats' and protect his family - this time around. 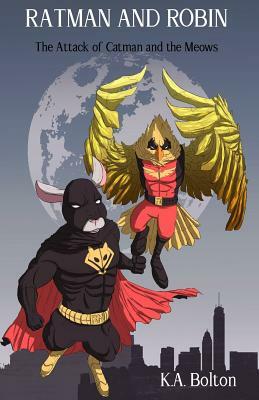 And to do so, he and his best friend Birdie, must transform into their cape crusader alto egos: RATMAN AND ROBIN and take on the cats in a series of action packed combats.Will he win the battle and save the ones he love - or will he lose it all?Laugh-out-loud funny, entertaining, action packed Ratman and Robin: The Attack of Catman and the Meows is the perfect gift to get your child, grandchild, niece, nephew or student off the screen and into the books. Resolve to grow a reader. Get them the gift of reading while being entertained **Raving reviews on Amazon, Goodreads**What readers are saying: 'Ratman and Robin got my 2nd grader to start reading''My 9 year old son absolutely loves this book and he's not that much into reading''Great book to read to younger children or to have older children read on their own. ''I would without reservation recommend this book to anyone, young or old ''This book is awesome ''I couldn't stop reading. ''Great Read.